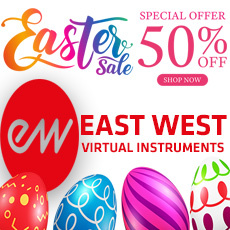 EASTWEST/QUANTUM LEAP announces HOLLYWOOD STRINGS virtual (software) instrument — a collection of string instruments with unprecedented control over sound and performance. Joining Rogers and Phoenix as co-producer on HOLLYWOOD STRINGS is Thomas Bergersen, a highly respected composer and orchestrator, and Phoenix’s partner in trailer music company Two Steps From Hell. His extensive experience in composing for orchestras and with virtual orchestras made him a perfect fit for the multi award-winning team of Rogers and Phoenix. Shawn Murphy, is an ACADEMY AWARD, C.A.S. (Cinema Audio Society), BAFTA, and EMMY award-winning sound engineer who has recorded and mixed the scores for more than 300 feature films including Indiana Jones and the Kingdom of the Crystal Skull, Star Wars: Episode II - Attack of the Clones, Star Wars: Episode III - Revenge of the Sith, Star Wars: A Musical Journey, Jurassic Park, Jurassic Park The Lost World, Harry Potter and the Prisoner of Azkaban, Titanic, The Curious Case of Benjamin Button, The Bourne Ultimatum, Minority Report, Saving Private Ryan, Munich, The Passion Of The Christ, X-Men: The Last Stand, Memoirs of a Geisha and Ice Age. I wish they could provide the plugin with 24bit sounds instead of 16bit. However, a great, great plugin. Wonderfull sound but still coming to grips with software. This was my first EW software purchase but I have now ordered more. So far very impressed.